This course will provide both an introduction to the practice of meditation as well as in depth guidance for the progression into the practice. Open to beginners and seasoned meditators alike. Classes will include group sitting meditation, presentation, discussion and meditation interviews with the teacher. Please purchase a copy of the book here from your preferred outlet prior to the start of the class. This two part course will be part three and four of our longer term Path of Meditation series. 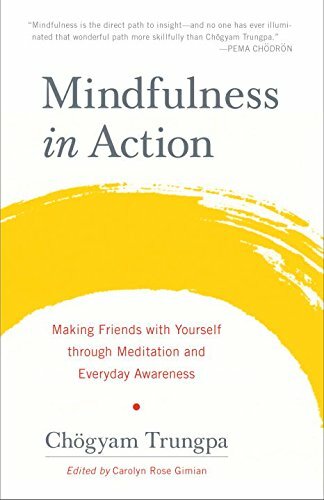 Mindfulness in Action: Making Friends with Yourself through Meditation and Everyday Awareness is, as the title suggests, a book about mindfulness and its application in the context of our whole life. The book focuses on the practice of meditation as a tool for developing mindfulness and explores how mindfulness and awareness influence our everyday life. It is a book for people who want to explore mindfulness through the practice of meditation and also apply meditative insight in their lives. It includes instructions for the practice of meditation, as well as an in-depth look into the principles of mindfulness and awareness. peace. It is also about developing insight and clear seeing in one’s practice and daily life. The author invites people to try his approach, but the insights offered in this book apply to whatever approach to mindfulness meditation you employ. Led by WBC Senior Teacher Derek Kolleeny. Drop in visitors welcomed! This course is part three and four of the path of meditation series which began with "How to Meditate Course" based on a book by Pema Chödrön and will next include a course on meditation as presented by Chögyam Trungpa in "The Profound Treasury of the Ocean of Dharma" Course. Parking available on Smith Ave., and a few spaces beneath the building. Free parking available on Smith Avenue at all times. 1 and 1/2 miles from Saw Mill Parkway and Interstate 684.